Anyway, it's been about 4 days since I've came back from KL after attending Future Music Festival Asia 2014 (FMFA2014) which was a super huge let down... I'll talk more about it later. And over the last 4 days, I've just been bumming around and fixing this post together really slowly. hehehe. Finally. I don't really know if I should be relief that the trip is finally over or if I should feel really upset and disappointed about it. Here's the thing about me, I feel as though I kinda have a sixth sense where if I think something isn't going to happen, it really won't happen. Back when I was a kid, I remember getting invited to Escape Theme Park by a schoolmate. It was cool then and I was only about 9? Hence, I was dying to go but a part of me knew that it wasn't going to happen. I did everything right that very day we'd planned to go but in the end, I didn't manage to go at all. I've encountered stuffs like that countless amount of times in my life till a point that I think, maybe it really is a sixth sense. And that same thing happened again at FMFA2014. As you all probably already know, I am fan of trance music. I wouldn't say that I am a fanatic, I just really enjoy that genre a lot. It was started when I went for a little trance party at Homeclub some time back. That was the very first time that I truly enjoyed myself without the need to consume alcohol at all! Andrew Rayel was playing then and ever since, I've become a fan of his and was looking forward to seeing him at FMFA2014 day 2! At the moment, trance isn't played much in Singapore simply because majority of Singaporeans don't appreciate it... yet. I hope. Everyone's only crazy about DJs like Hardwell or Zedd.. I like them too. But not as much as I like trance music. So the moment when I heard that there was going to be A State Of Trance (ASOT) at FMFA2014, I went crazy. I knew that I had to be there no matter what and I told myself that this time I see Andrew Rayel, I have to know every single one of his music. Similar to what I did back when I was 9, I did everything right to make it happen. I wanted to go to the venue by 6PM knowing that some of the other great trance DJs start performing at that time. However, due to unforeseen circumstances, we only made it there by 8.30PM. We were facing problems after problems and it was so upsetting. What made everything worst was hearing my favorite song- One Home by Andrew Rayel playing while we were queuing to get in!!!! AND YOU KNOW WHAT KILLED EVERY SINGLE MOOD I HAD?!?!? Andrew Rayel switched for an earlier set with another DJ. WHICH MEANS I DIDN'T GET TO SEE HIM PERFORM AT ALL!!!!! I was utterly disappointed that nothing regarding this was announced at all. 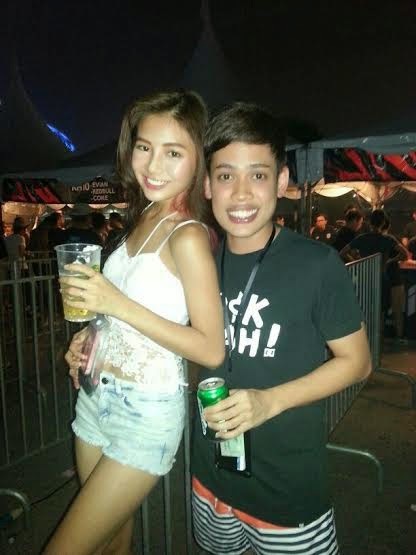 Another thing that I wasn't so pleased about FMFA2014 was how they only sold Asahi beer, Carlsberg or Somersby Apple Cider as alcoholic beverages. I don't drink beer. In fact, I HATE IT! And Apple Cider can't make you high enough. 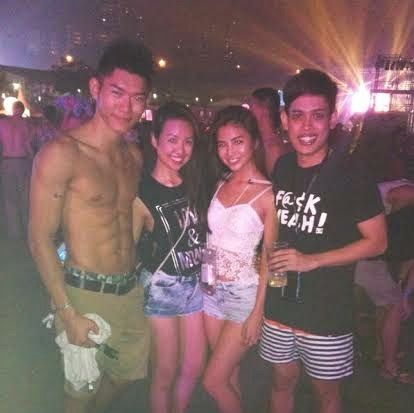 FMFA2014 is nowhere near the standards of Zoukout2013 in that sense. And it wasn't just the drinks that were shocking. Their security system was a waste of manpower. I wanted to say "effort" too but hey, no effort was put into it. My ID and bag were NOT check at all. They only checked our tickets. That's it. As mentioned on twitter, an underage kid could have simply walked in. It's ridiculous!! No wonder people were taking drugs so openly because nobody gives a f*ck anyway! That one night was such an eye opener. Never would I've thought that I would be standing next to a person high on drugs. Or witness people passing a bag of weed around. It was scary and through it, I've learnt to appreciate Singapore a lot more. Whew! I wouldn't say that it was a great experience but it was an experience that I wouldn't get anywhere else. Don't worry, I won't flood my blog with my selfies, that wouldn't be called a blog then. Would it? 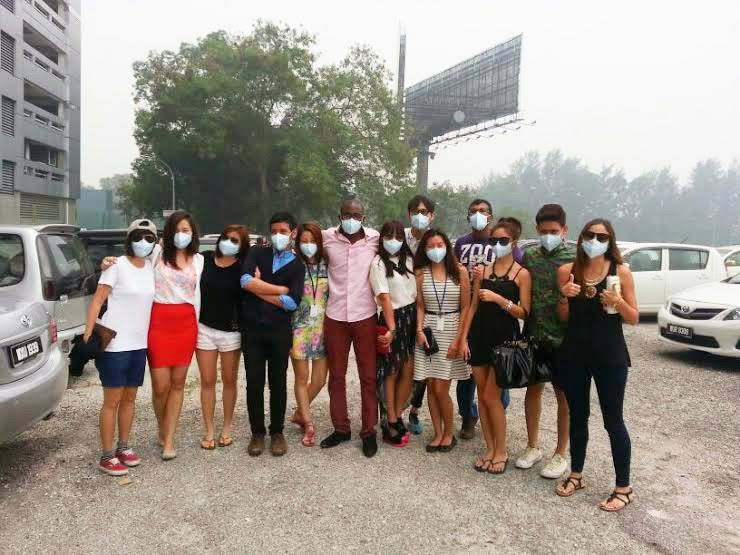 On our way to KL, I had some Malaysian readers telling me that the haze there is crazy and that I'd better prepare myself. 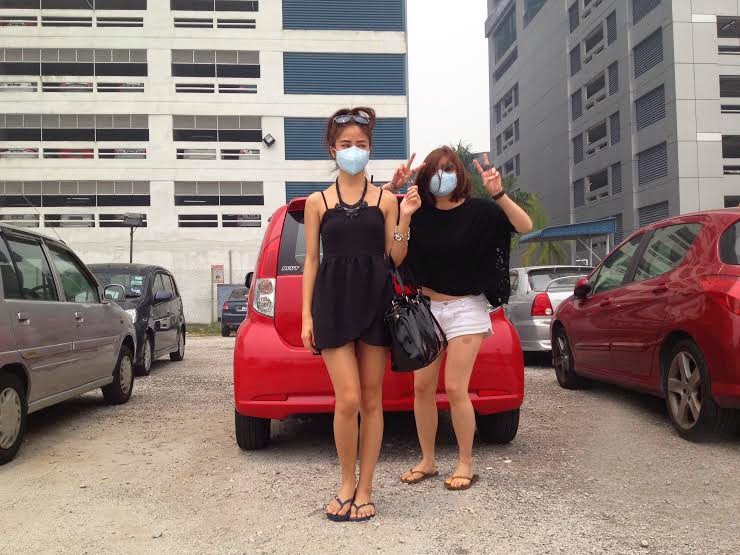 I took their advice lightly, which I really shouldn't had because I was blown away by how terrible the haze really was. It isn't as bad as what we had experience in Singapore a few months back. But it was close to that. 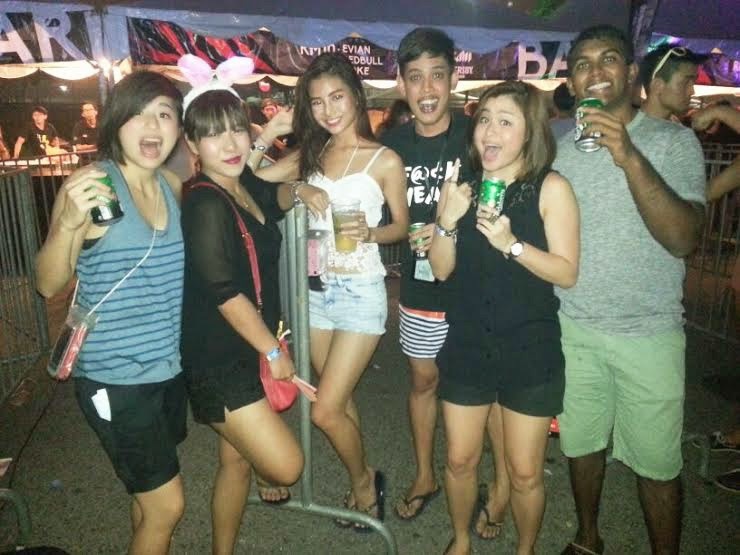 So you can imagine how crazy it was to party in an open space for FMFA2014 with the haze being that bad! Anyway, here are the details of the awesome food we had in KL!!! We went to Kafe Jo Jo Little Kitchen for their signature Chili Pan Mee. I don't know where it's located at simply because Malaysia is HUGE! The only away to travel around is either by cab or car. I got the following address from the web. No.30, Jalan Kuchai Maju 9, Off Jalan Kuchai Lama, 58200 Kuala Lumpur. The signature chili used for the dish! Initially, I didn't get the hype about this at all. Everyone from the Gushcloud team were all excited for this bowl of noodles. They were talking non stop about it and Fai kept going on and on about how I'm going to love it. I kept my expectations low in case it doesn't taste that good anyway. But the moment, I'd placed a spoonful of noodles in my mouth, I was sold. It was one of the most delicious things I've ever tasted in my life! Kinda tasted a little bit like one of my mom's dishes. If you enjoy savory dishes, you gotta try this Chili Pan Mee out whenever you have the chance! I know for sure that Jo Jo's a stop I'm gonna make on my next visit to KL. I might just travel up there to eat this. It's SO FREAKING GOOD. The noodle is handmade and is extremely soft. No words can describe the scrumptious taste of the minced meat. My mouth is watering from just talking about it. Rovik from The Hidden Good. kept going on and on about how good Jo Jo's is. ANYWAY!!! If you don't see yourself traveling up to KL any time soon for Jo Jo's Chili Pan Mee, fret not!!! Another Chili Pan Mee shop has just landed itself in Singapore! They're called Kin Kin and are located at 534, Macpherson Road. They're known to be the ORIGINAL Chili Pan Mee restaurant that has been around for about 30 years. More info and visuals of their signature noodles in my next post! :) If you do try Kin Kin any time soon, take my word of advice and go easy on the chili. THE DAY I WAS WAITING FOR FINALLY CAME!! 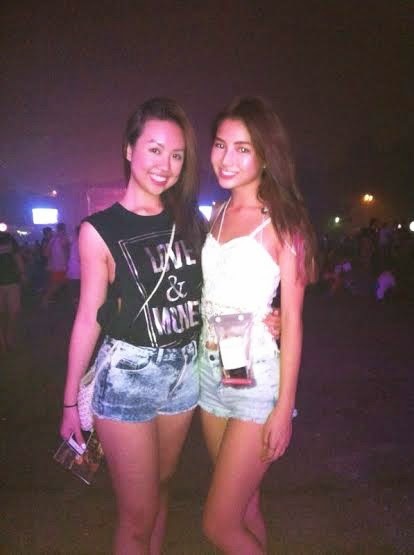 We were dressed for FMFA2014, ASOT!!! Honestly, I didn't know what to wear. Planning my outfit for Zoukout last year was easy knowing that it was held at Siloso Beach, which inevitably means BIKINI!!! But FMFA was held at a National Stadium... So what the hell do I wear??? 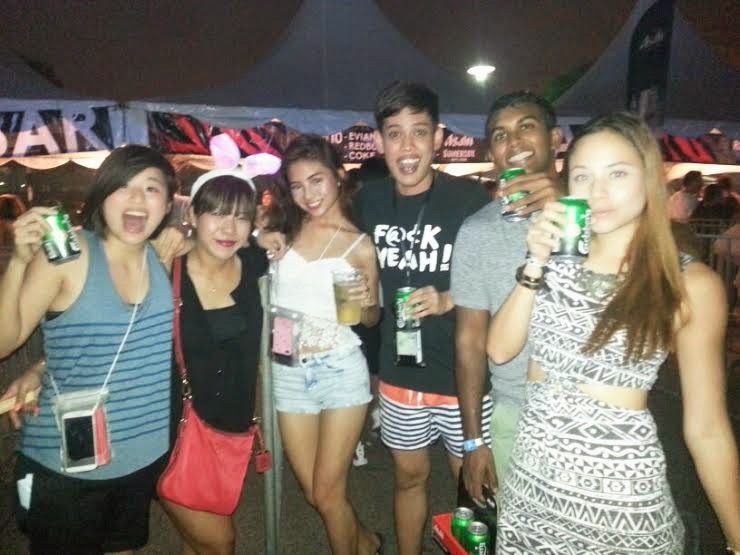 I did a little bit of research and found out that some people actually dress up for FMFA. Like they literally dress like how one would dress for Coachella or something and that's just CRAZY. I rather wear flip flops and comfy clothes so that I can truly enjoy my night without having to worry about my boots getting stepped on etc. So here's what I wore^^ I know quite a handful of you have been asking where I got this top from, but I'm sorry, I honestly can't remember. I did an advert for it some time back, so I guess you'll be able to find out where it's from by scrolling back a little. My shorts are from H&M! Urgh.. my hair looks damn damage here. Need to head back to Salon Vim soon!! After about an hour of partying, everyone went separate ways. Not on purpose. HAHA. But everyone kinda disappeared one by one. Fai accompanied me to the toilet and we just couldn't find everyone else after. It felt pretty scary because by that time, people were noticeably taking drugs openly and anything could happen. And as we all know, things did happen. According to the news, 6 lives were lost that night from drug overdose. To the families of those lives, please accept my condolences on the loss of your loved ones. I admit that I was pretty angry initially by their irresponsibility and how day 3 of FMFA was cancelled because of their deaths. By after much thoughts, I'd realized that they weren't fully to be blamed. The security measures taken by the authorities were obviously not carried our effectively! As mentioned earlier in this post, they didn't check my ID or my bag either. Someone could have brought in a weapon and they wouldn't even know. Anyway, Fai and I went out of the "mosh pit" after a while and decided to grab a bite. The awesome thing that FMFA has that Zoukout doesn't have is FOOD!!!! KL is kinda all about food huh? There was a good amount of about 10 different stores selling a wide variety of festival food. I was spoilt for choice. I was so hungry that I could eat everything. They even had a Pizza Hut stand! And after roaming around the entire venue which is about 3-4 times the size of Zoukout, we bumped into some of our Singaporean mates! hehe. In times like these, it always feels great coincidentally meeting someone you're familiar with. 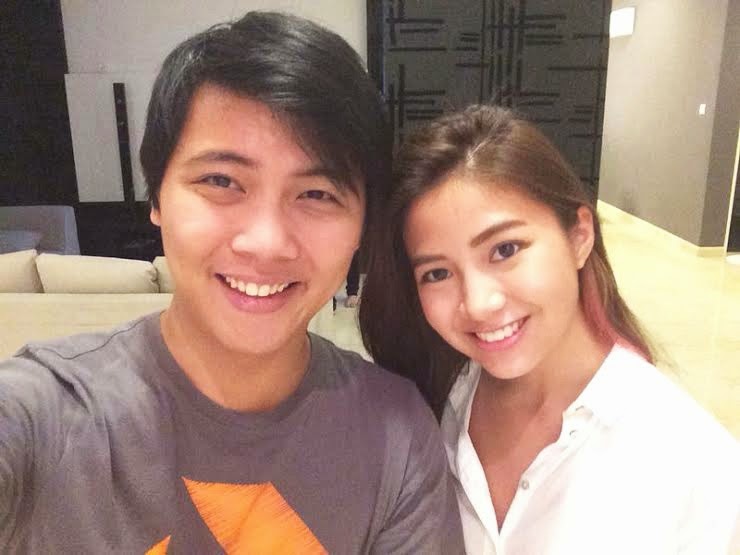 With the super pretty Renee! Met her from A&F. We're both probably from one the first few batches. And Marcus! Whom I've realized happens to have tons of mutual friends with me. Oh wells, that's Singapore for you. Everyone's connected somehow. The night ended well. We managed to meet up again and everyone headed back to the penthouse together safe and sound. ASOT was pretty disappointing. Even Fai said that no one managed to beat Dash Berlin during Zoukout :( Oh wells... Maybe the alcohol's to be blamed. Who drinks beer in clubs anyway?! We woke up the next day to find out that day 3 of FMFA2014 was cancelled. Can this trip get any worst?!?! First, internet connection is SLOW. Then, we had to battle the haze. Then ASOT wasn't as great as we thought it would be. And now, day 3 that was supposedly the biggest day is cancelled? We all needed to sit back and treat ourselves. And treat, we did. OH MY GOD. It's mind blowing. Never again will I eat Nasi Lemak in Singapore because they all taste like c*ap compared to this. The rice is so soft and fragrant and the fried chicken wing is just perfect. Sighh... 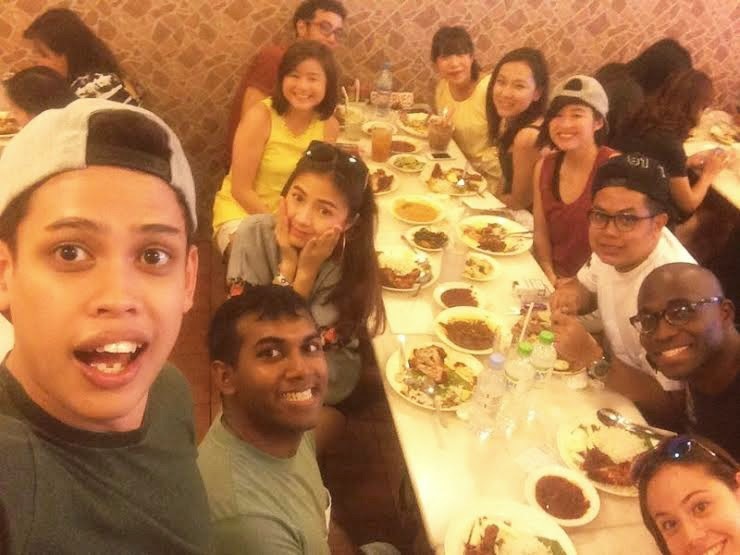 I wanna go back to KL now just for the food. Tummy rumbling now. This is torture. Headed back to the house after for more work and a long nap since there's practically nothing to do. So, I basically just eat and sleep a lot on this trip. Which explains why I feel extremely unhealthy now and need to gym and go on a diet so badly! Anyway, met up with Ming Han for the second time at night. You'd probably find him familiar. That's because you've probably watched one of his viral videos on Youtube before! Along with his brother, who is also called Ming, he owns a Youtube channel called The Ming Thing. Why watch TV when you can enjoy better content on the internet nowadays thanks to channels like theirs! It was such a pleasure meeting them and it actually felt pretty surreal at first because I've seen them on several Youtube videos before. One in particular called No Offense by Tree Potatoes! Really talented and inspiring duo that helped me end my trip on a better note. hehe. I guess God really works in mysterious ways huh? Thank you Janice, Aaron and Elliot for inviting me to be a part of this video and all of the other videos that I was a part of as well. It was awesome meeting Wong Fu and it was such an honor too. Alright, I shall end this post now. This is probably one of the longest posts I've ever written with tons of elements put together huh? Okay, it's crazy and I'm going crazy. I've been writing this since 12PM and it's already 7.15AM. I am deprived of rest. I've always thought that Vogue Avenue stands out a lot from most of our local blogshops simply because they never fail to bring in pieces that you can't find anywhere else. I am certain that you are already familiar with them and you know how they make sure that every item offered is of a certain standard. Which makes them a shopping destination that should be on top of your list at all times! I love their recent collection, filled with classy and timeless apparels. And I'm sure you will too. Classy and effortlessly stylish, that's how you'd describe a top like that. The moment I wore this piece during the photo shoot, I knew that it was gonna be my top pick! It's really comfy and I love how it fits me perfectly! Tops like that usually have pretty huge arm holes but this one is just the right size. Comes in 3 other colors as well. Look at how good these two pieces look together! Puff Ball (or Pom Pom) shorts are totally in! How can I not own one?? There are tons of designs out in the market but I truly feel that this one I'd picked from Vogue Avenue is probably one of the better prints I've seen so far! It's really comfy and the side slits elongates my legs! Splurge!! I believe that Sassy Dream is no stranger to your wardrobe! They has been around in the industry for the longest time and up till today, they still offer a wide variety of the trendiest apparels in every collection. Shopping at Sassy Dream is obviously always a blast because there's just too many good things to yearn for in just one space. Next, I went for another basic MUST HAVE apparel- the denim bralet! It definitely looks good with anything and I can see myself turning to this piece whenever I'm in doubt. I've come across a lot of denim bralets over the past few years and it's pretty hard to find one that I really like. But I have to say that this one is one of favorites! Comfy and timeless. Sassy Dream is also available at the following spaces. Enter "Eunice10" to enjoy 10% off your total bill. I love this top! It looks great on it's own and it's really versatile! I can pair with with a pair of shorts and boots for a casual day out in town or with a pair of midi flare skirt and heels, and I'll be all dressed up for an event. It's undeniable comfortable and effortlessly chic. 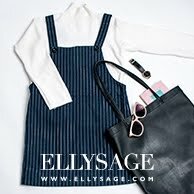 Check out Ellysage on their social media platforms for more updates.